The RSLIC18 family of ringing subscriber line Interface circuits (RSLIC) supports Analog Plain Old Telephone Service (POTS) in short and medium loop length, Wireless and wireline applications. Ideally suited for remote subscriber units, this family of products offers flexibility to designers with high ringing voltage and low power consumption system requirements. The RSLIC18 family operates to 100V which translates directly to the amount of ringing voltage supplied to the end subscriber. With the high operating voltage, subscriber loop lengths CAN be extended to 500 (i.e., 5,000 feet) and beyond. Other key features across the product family include: low power consumption, ringing using sinusoidal or trapezoidal waveforms, robust auto-detection mechanisms for when subscribers go on or off hook, and minimal external Discrete application components. Integrated test access features are also offered on selected products to support loopback testing as well as line measurement tests. There are five product offerings in the RSLIC18 family: HC55180, HC55181, HC55183 and HC55184. The architecture for this family is based on a voltage feed Amplifier design using low fixed loop gains to achieve high Analog performance with low susceptibility to system induced noise. 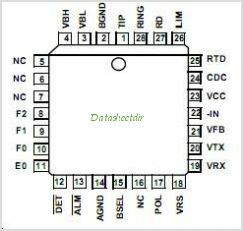 This is one package pinout of HC55184,If you need more pinouts please download HC55184's pdf datasheet. 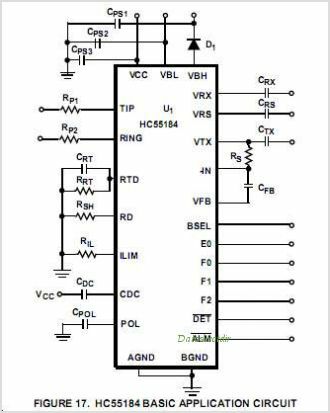 This is one application circuit of HC55184,If you need more circuits,please download HC55184's pdf datasheet.